scaPEPgoat wrote: And although it did not end up mattering, How does UEFA assign a Portuguese ref for this game? Finals in Lisbon? CR7? Because at the end it did not matter. very true. If we played well and scored what we needed, it would be a mute point who reffed. I like the idea of relying on ourselves instead of refs anyway. UEFA were thoughtful, predicted what would happen, and gave us an extra excuse to use to defend ourselves. Badger wrote: I feel that it is not appropriate to say too soon that there was anything good about Bayern’s result last night; it could come across as a fan in denial. However, there is one thing that I am now grateful for. I’m glad it was a huge defeat rather than a small one. If Bayern had had a narrow defeat, Bayern might still be trying to explain it away as an irregularity, and try too much of the same approach against a similar team another time (Dortmund in German Cup Final?). After conceding 4 goals at home and being unable to score in 180 min, in spite of bringing on just about every available striker and midfielder, Bayern are forced to reconsider both (a) the tactics against such teams and (b) the comparative quality of some players when they meet opponents at the highest level. The Dortmund final should be an interesting study, and so will Bayern’s activity in the transfer market this summer. I think last night’s game could have changed Rummenigge’s mind from buying a good central defender to buying a world class central defender this summer. Wholeheartedly agree. A defeat like that might just be the wake-up call the team needed. Totally embarrassing and unacceptable result for the Bundesliga. I have question about the choreo. Does anyone know if the black and yellow colours were included as the colours of Munich or were they intended for Dortmund ? 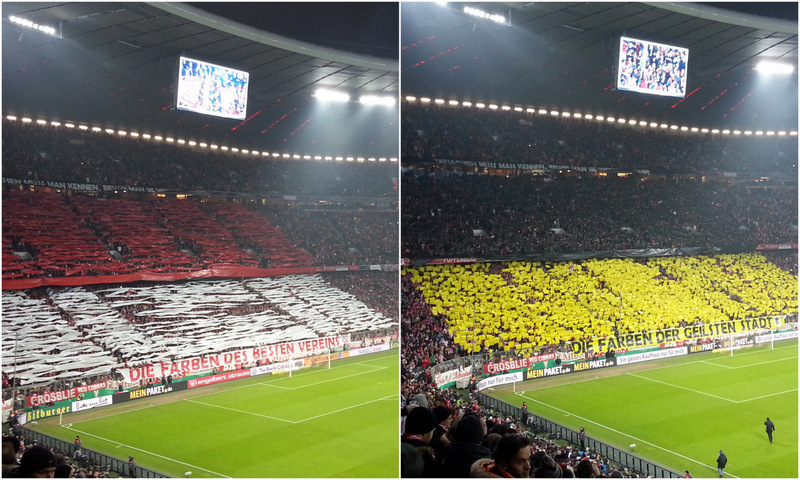 As the colours of Munich, without any doubt. How are these choreos made? Who has cut out those plastic bag squares. The choereo thingy has always facinated me, it's amazing how a stadion full of people can transform into a single picture/slogan. Rauntšik wrote: Who has cut out those plastic bag squares. In the last tweet below it says it took 100 volunteers 72 hours to complete the choreography. Rybko90 wrote: Totally embarrassing and unacceptable result for the Bundesliga. Bayernbazi wrote: I have question about the choreo. Does anyone know if the black and yellow colours were included as the colours of Munich or were they intended for Dortmund ? Why would they want to include Dortmund's colours? Black and yellow are the colours of the city of Munich. Red and White our club colours. Red and White are colours of of the Dortmund city. And Black and Yellow the colours of their football club. PS : I remember under Jupp when we played them away there was a banner saying ' Black and Yellow - the colours of best city; and Red and White :- the colours of best club. I know. What I meant was that, in response to the question, it was obviously because they are the city's colours. We have no reason to show black and yellow because they are Dortmund's colours. I guess they probably intended it for City of Munich. I remember the other choreo were they had used it as the city's colour..and here it was obvious that this was done to mock Dortmund ! This went even further because Dortmund had used it by mistake in their Fan Catalogue.